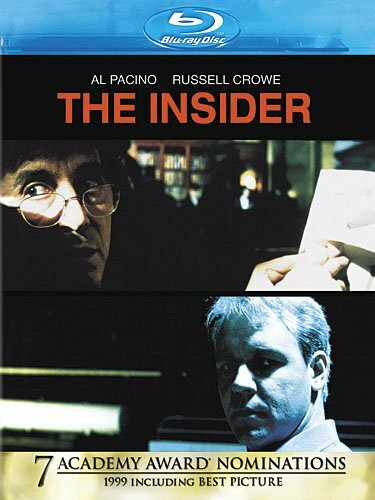 THE INSIDER was released on this date in 1999. That makes it fifteen years old today. It’s a quinceañera! This is one of my favorite movies, and this piece, written last year, comes from my personal website. For all his technical experimentation, psychological insight, and sophistication of purpose, Michael Mann is essentially a pulp director. It’s very rare that he departs from the overarching genres of noir and action. THIEF, MANHUNTER, HEAT, COLLATERAL, MIAMI VICE, and all of his TV work (Crime Story, Miami Vice, and Luck) are all neo-noirs. LAST OF THE MOHICANS and PUBLIC ENEMIES are history-based action movies. Even ALI, a biopic of one of the most famous men to have ever lived, could be argued to fit within these bounds as more of a genre film than the standard biopic, since the boxing film has always only been a step away from noir and Mann’s compositions in ALI remain moody and romantic as in any of his other films. THE INSIDER, then, is perhaps Michael Mann’s most high-minded movie, and on paper, there’s no reason it should be remotely as watchable and re-watchable as it is. It’s a true story about network TV, newsmagazine journalism, and big tobacco, and yet it’s suspenseful, moving, and entertaining as all hell. It belongs to the same line as ACE IN THE HOLE, THE PARALLAX VIEW, and ALL THE PRESIDENT’S MEN, yet ironically it’s more grounded in realism and less dependent on lurid incident than any of them. There’s only one bullet in all of THE INSIDER, and it isn’t ever seen in motion. The drama of THE INSIDER comes from depositions and confidentiality clauses, lawyerese and how it makes the layman’s head spin, of good intentions and obfuscations and families straining under corporate pressure. It’s a thriller where the suspense is primarily internal. The roiling atmosphere that engulfs the film is stormy and ominous and reflective of the thought processes of the lead characters. So much of that comes from the robust, dynamic, iconoclastic directing choices of Mann, working with his cinematographer Dante Spinotti, returning from MANHUNTER, LAST OF THE MOHICANS, and HEAT. Mann and Spinotti enlist their typical blue-gray palette, but this time there are greens and oranges and constantly disarming variations on all of the above — all of which keep the movie from resembling any other ever made. THE INSIDER has an unprecedented look, which separates it from easy comparison, while making it easy on the eyes for its duration. There’s also a rare intimacy and tactile sensation to THE INSIDER, beginning from the very start, where Al Pacino as60 Minutes producer Lowell Bergman is driven to a meeting with a Hezbollah leader — we can almost feel the ridges and pores of the blindfold over his eyes as it ripples with the wind and sunlight flickers through. You can feel the otherworldliness of a driving range at night, the dampness of a rooftop just after a rain, the sticky warmth of a bar, the sterile isolation of a hotel room. The movie puts the viewer in these environments, which makes the story feel that much more urgent. In a word, THE INSIDER is absorbing. Absorbing. That happens through unity of disparate crafts. The musical selection, both of score and soundtrack, is impeccable and distinctive as it ever is with Mann, and the editing style is precise and hypnotic. The script by Mann and Eric Roth is impeccably-rendered, full of dialogue that is full of truth and untruth and both and neither, and then to deliver it, you have a roster of some of the world’s greatest actors, led by Al Pacino, bellowing but focused in maybe his last truly excellent role to date, Christopher Plummer in his rummiest of cadence as beloved newsman Mike Wallace, and Russell Crowe, who was so ferociously incredible in his transformative role as the title character that the 1999 Oscar voters realized they fucked up by not giving him Best Actor for this movie and corrected the mistake the very next year. 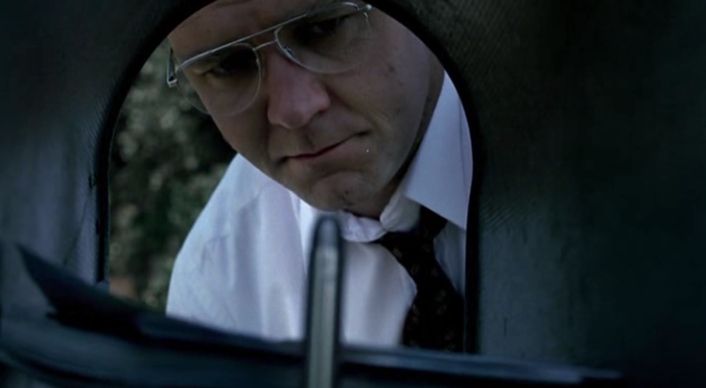 In fact, is there anyone who is seriously willing to argue that the elected Best Picture that year, AMERICAN BEAUTY, is in any way comparable to THE INSIDER as a whole? Award seasons come and go. What stays is movies. THE INSIDER is available on Blu-Ray now.